With water surrounding us on three sides anything you want to do on the water you can do here. Find information on tours, surfing, snorkeling and scuba, waterskiing, kitesurfing and windsurfing, paddleboarding, canoeing, kayaking, sailing, boating and jet skiing. LAKE – CAROL MORRISON PARK on Fort Pond (lake) is a great place to launch kayaks, canoes, SUPs, etc. for recreating on the calm lake. Limited parking. Rent skiffs, bowriders, and center consoles. Their rental fleet ranges from 16ft to 31ft with all equipment for water skiing, tubing, wake boarding, and fishing. In the Village rents sailboats, hobie cats, and pedal boats to take on Fort Pond. Canoe or kayak on Fort Pond, Fort Pond Bay, Lake Montauk, or one of Montauk’s hidden ponds. Rent canoes & kayaks for Fort Pond. Rents ocean kayaks and plans excursions or lessons for the more adventurous. Sunset cruises, educational ecotours, seal/whale watching, stargazer cruises, lunch and swim tours, charter excursions, and a host of other iterations are increasingly available in Montauk’s waters and along our beautiful, unspoiled coastlines, catering to a variety of customers. Day & evening outings amidst beautiful fluttering sails of our fleet of Polynesian-inspired catamarans” as we now have 3 different boats ranging in size from 26’ to 65’ for different needs. At Gurney’s Montauk Yacht Club. 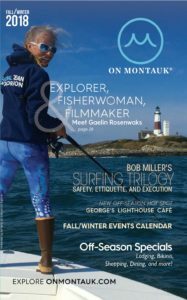 Peconic Water Sports is now offering Water Sports lessons, rentals and charters in Montauk! Come join us on our brand new Malibu Wakeboard boats to wakeboard, waterski, wakesurf and tube! We are located at Star Island Yacht club at 59 Star Island Rd, Montauk. Rent jet skis for Block Island sound under the watchful eye of their instructors. Any boat you rent can handle tubing, wakeboarding and waterskiing. Offers sailing lessons, charters, and bareboat rentals for individuals or groups, plus a junior sailing program. SU paddleboarding is increasingly popular and great exercise, fun, and works everywhere: ocean, sound, & lakes. Rents SUPs, gives lessons, and tours; info@coreyswave.com. Don’t know how to surf? The talented and experienced instructors at Air & Speed Surfshop will show you how. They sell and rent equipment and offer Surfing Camps for ages 7-14 throughout the summer. Professional surfing instruction for all ages and abilities, private or group, plus guided surf trips, a kids’ surf academy, and stand up paddleboard rental and instruction, plus group surfing events and parties. MTK Cruises offers an experience you’ll never forget. Many of their tours are designed for two hours and for those looking to spend more time on the water, there are three and four-hour tours as well as private charter tours and cruises. Whether you have your own boat or rent one, Lake Montauk is the place for waterskiing. Rent skiffs, bowriders, and center consoles. Their rental fleet ranges from 16ft to 31ft with all equipment for water skiing, tubing, wake boarding, and fishing. Lessons and Rentals.